Intense levels of performance, a multifaceted character and luxurious comfort. In total keeping with Pershing’s style, the painstaking design of the Pershing 58’s internal and external layouts has resulted in remarkable interiors and an optimum use of space for a craft of this size. With three cabins and three bathrooms, a convenient dinette, a fully equipped galley, crew cabin and carefully studied spaces, the Pershing 58′ guarantees the finest onboard living comfort. Thanks to its 3-level structure and high ceilings, this craft offers a lot, like the original way in which the galley is elegantly separated from the living area by a translucent aluminium and glass partition. Or by the refined Master Cabin that succeeds in expertly exploiting all the available room of the central part of the yacht. With the distinct personality of its design, the Pershing 58′, has a harmonious profile made more aggressive by its side band and black inserts. A powerful character confirmed by its levels of performance that enable this yacht to cruise comfortably at 45 knots and more, even when fully laden. An aggressive, streamlined 64-footer specially created for those who don’t accept compromises and who love the comfort, space and luxury of flybridge craft, and the excitement of open sports-style performance. A forerunner of innovation in terms of style and functionality, the Pershing 64′ includes amongst its many features an elegant and harmonious long side window that gives the craft’s structure a particularly sleek appeal. The Pershing 64′ has an ambitious design and the most important feature of life onboard is undoubtedly the vast saloon that stands out immediately. This area can be completely closed and air conditioned to achieve the privacy of a sophisticated lounge. Alternatively, thanks to an exclusive slideaway glass partition separating the internal saloon from the external cockpit, the whole area can be opened up to the sky. 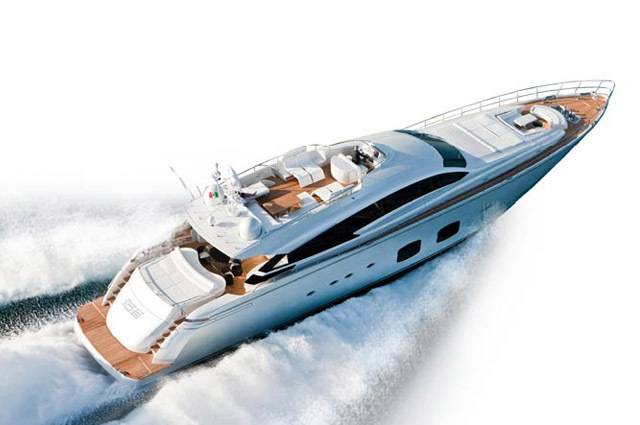 Here, the sensation is the same as that of standing on a huge terrace overlooking the sea and to intensify the feeling even further, the craft is fitted with the shipyard’s latest generation hard top that slides back to adjust the degree of shade in the cockpit. This feature endows the model with an unimaginable level of liveability and spatial flexibility, making it ideal for both Mediterranean climates, thanks to its open yacht appearance, and tropical temperatures that often require interior air conditioning. 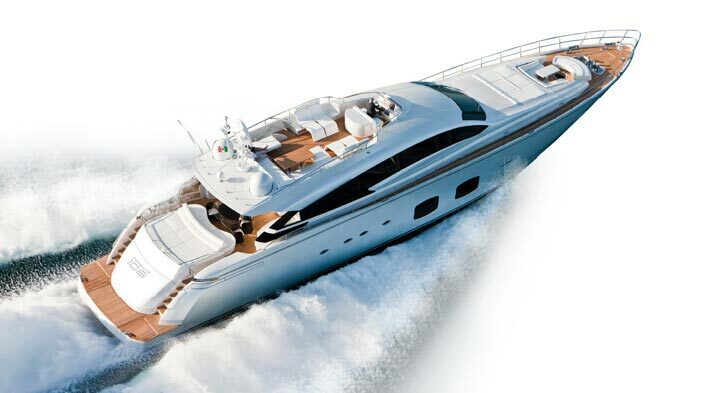 The innovative windshield on the Pershing 64′ also deserves a special mention. Constructed from a single pane of glass, the shield offers panoramic visibility stretching for 3.75 metres without interruptions. In terms of performance, the craft’s twin 1550 hp MAN engines and Arneson ASD 14L drives, guarantee peak speeds of no less than 46 knots. The painstaking care taken over every detail and insistence on avant-garde solutions can be seen in the design of the Pershing 72’s exteriors and dynamic outline, especially in: the radically new hull profile, a sleeker look thanks to the particularly long stretch of the side windows: an absolutely new feature creating an elegant and harmonious arc, unbroken by the customary twin window division. Particular attention has been paid to the interiors of the Pershing 72 combining superb craftsmanship with fine materials and tradition with carefully tested innovation in all its highly contemporary furnishings. The interior layout is another feature that makes the new Pershing 72 so special as it offers owner and guests ultimate comfort thanks to its increased floor space. The night area stands out particularly for the sophisticated comfort of the ‘full beam’ Master Cabin that is amazingly bright and sunny thanks to two specially built-in, open-view windows that offer spectacular panoramas. 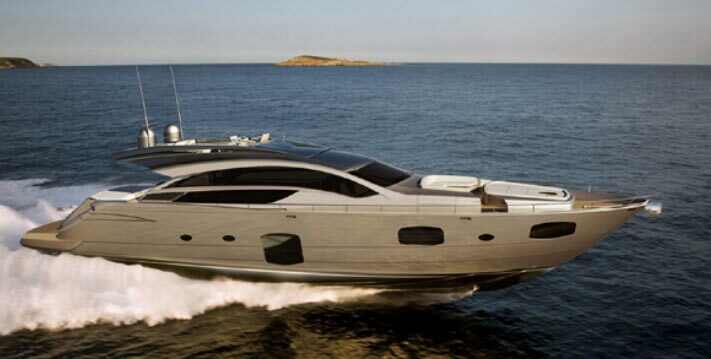 The PERSHING 80 is a model that openly challenges its category competitors by combining innovative design with distinctively sports style performance. Her sleek style and advanced onboard technology continues the strategy of luxury begun with the Pershing 72, the craft that won numerous awards. All this extended to 80 innovative feet that confirm the shipyard’s strategy of focusing its know-how and enterprise on this prestigious segment and its decision to continue to develop craft of increasingly major dimensions. Harmonious contours that guarantee perfect streamlining and top performance, the PERSHING 80 offers exceptional speed and control. 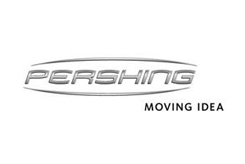 A revolutionary model in this size, the Pershing 92 substitutes the Pershing 90, being totally new and improved in all aspects. With a new sporty and elegant exterior design, combining the use of the large windows to give great luminosity to the interiors, and innovative design features. The fly deck, almost invisible looking at the profile, completely equipped with sofas and a table that transform at the push of a button into a large sunbathing pad, plus the possibility of a control station in order to drive the boat from up top. The cockpit is equipped with a fixed table and sofas for 8 diners, and an aft sunbathing area. The access to the saloon is by way of large glass doors. Together with the aft window, they lower into the bulkhead, leaving the area totally open creating continuity between the saloon and the cockpit. The saloon benefits from lots of natural light thanks to large windows and the aft doors and window, and a large sofa and dining area. The main helm is very well equipped and has great visibility. The galley is located with the crew area.